As you can see from my quote, the hopes I had placed on this album based on Euphoria have not been realized. This is easily the most commercial album from the Lepps, more so than even Adrenalize or Hysteria. X is very mellow, with many slow, acoustic based songs such as Now, Unbelievable, and Everyday which are three of the first four songs on the album. That's not so bad, but all too often this album smells of modern pop / top 40 for my tastes. Love Don't Lie, with the synth use and electronic effects is one of the most glaring examples. Gravity is even worse in that it has an almost rap like verse and several electronic / synth effects that will have most long time fans of the band scratching their heads. Sure, Def Leppard's sense of melody is still fully intact and the layered harmony vocals are there, but there is more to a good song than just a cool melody or well done harmony vocals. Continuing on- Cry (one of the band's worst songs ever) could have come off the Slang album with its highly alternative vibe - ughh… Girl Like You is another song that features heavy synth use and a much too evident drum machine. Again, this is another song that dives way too far into the teenage / modern-pop / top 40 world for my tastes as well. Songs like Paper Sun, Promises, and Kings of Oblivion from the previous album had me thinking the guys were getting back into form and would release a truly killer hard rock album in 2002. This is not much of a hard rock album, but more a melodic pop rock album. However, there are some highlights worth mentioning with this new album. The US release of this album finishes with the track Scar, which is perhaps the best track of the album. It features that Hysteria / Adrenalize drum sound and some very nice guitar work and rocks in a Kings of Oblivion or Paper Sun style with a catchy as hell chorus line and Joe Elliot's emotional vocals. You're So Beautiful is certainly a commercial number, but the classic guitar sound of the Lepps makes this song a standout. This song is full of hooks and features a nice solo for good measure. Long, Long Way To Go is one of the better Def Leppard ballads I've ever heard. A very emotional performance by Joe Elliot and a stunning chorus line make this song rank up there with the best of the band's ballads. Four Letter Word is a catchy, party rock song that could have easily fit on the Adrenalize album. Its upbeat, rocking nature is a welcome nod to the band's past. I know a lot of Def Leppard fans gave up on this band after the Hysteria album, or Adrenalize at the latest. I prefer the band's first three albums, but I did find some good moments in the band's later work. 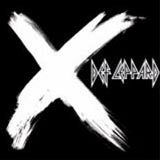 Although I might be one of the more patient Def Leppard fans out there, I'm really losing interest in the band with this album. I have pointed out some nice moments on this album, but they are so few in number that I can't firmly recommend this album to the majority of readers of this site. Except in a few cases, the band is moving pretty far from the hard rock genre and entering the pop / top 40 arena. In that respect, I suppose this album is a very nice pop / top 40 album if you like that type of thing. I feel that the Lepps have very little left to offer hard rock fans. The torch has certainly passed to a new generation of bands to keep the melodic hard rock genre alive today. If you have a taste for modern pop rock, you might enjoy this album. As for me, I instead choose to invest my time and money in the many excellent hard rock bands of today.